Is Endoscopic Balloon Dilation Better Than Surgery for Patients With Crohn’s Disease-related Strictures? In patients with Crohn’s disease (CD), surgical treatment of ileocolonic anastomosis strictures reduces risk of further surgery compared with endoscopic balloon dilation (EBD), researchers report in the August issue of Clinical Gastroenterology and Hepatology. 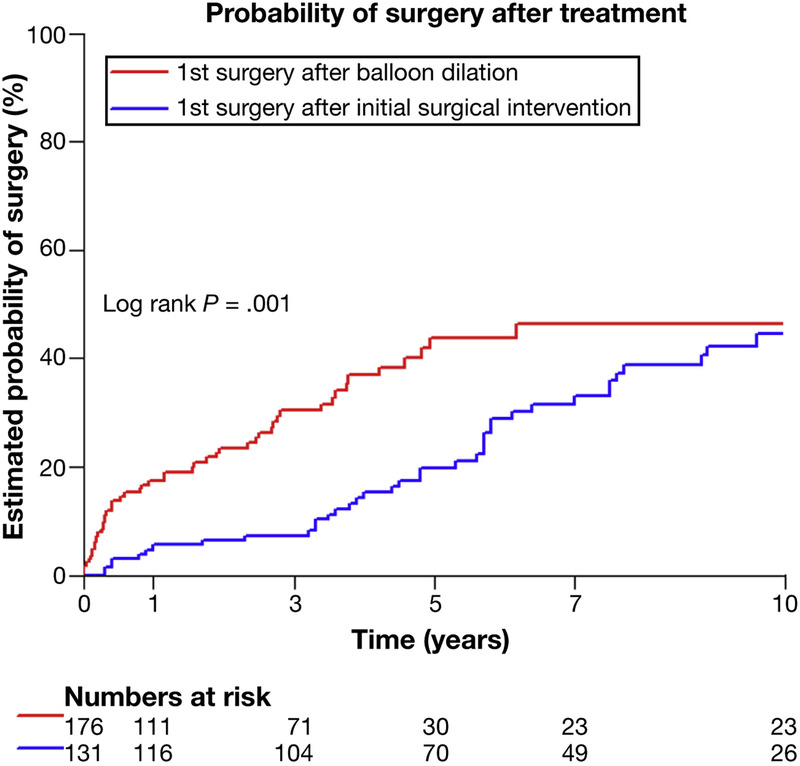 However, endoscopic balloon dilation (EBD) delays time until need for a second surgery; EBD should be therefore attempted first for patients with a lower risk for disease progression. Risk of subsequent surgery after the initial treatment for ileocolonic anastomosis (ICA) stricture (dilation vs surgery). As many as 80% of patients with CD eventually undergo ileocolonic resection for medically refractory disease. However, there is a high rate of recurrence of strictures at the site of the ileocolonic anastomosis. As many as 30% of patients with primary ileocolonic anastomosis require a second surgery in the area within 10 years. Multiple operations increase risk of long-term complications. EBD could therefore be an alternative. EBD has been reported to be safe and effective for treatment of the primary or anastomotic strictures in patients with CD. However, EBD of anastomotic strictures can be technically more challenging than in primary CD strictures because of the surgically altered anatomy. It has not been clear whether EBD or surgery is more effective for treatment of ileocolonic anastomosis strictures in patients with CD. Lei Lian et al performed a retrospective study to compare short-term and long-term outcomes of patients who underwent EBD vs surgery for ileocolonic anastomosis strictures. They analyzed data from 176 patients who underwent EBD and 131 who underwent surgery. The cohort was followed for a median of 2.9 years. EBD as the initial treatment for ICA stricture was associated with a higher risk for subsequent surgical intervention (see figure). However, on Kaplan-Meier analysis, EBD delayed the average time to surgery by 6.45 years. In the EBD group, over a median follow-up time of 1.8 years, 91 patients (51.7%) required subsequent surgery for stricture. The technical failure rate of EBD was 9.7% (17 of 176 patients). In a multivariable Cox regression model to assess risk factors independently associated with subsequent surgery, surgery as an initial treatment, shorter duration of CD, shorter interval from the last surgery to inception, only 1 previous resection, and an absence of concurrent strictures significantly reduced the risk for subsequent surgery. Lei Lian et al state that this is one of the first studies to compare EBD vs surgery for ileocolonic anastomosis strictures in patients with CD. In an editorial that accompaines the article, Talat Bessissow and Gert Van Assche summarize that patients receiving EBD did not require surgical intervention for an average of 6.45 years, whereas patients who underwent primary surgery had better long-term outcomes. However, Bessissow and Van Assche point out that the median follow-up period was much longer for the surgery group (4.7 years) than for the EBD group (1.8 years). This could lead to an inherent bias in which patients who failed EBD underwent surgery and were censored as stated by the authors. Bessissow and Van Assche add that the large cohort size is a clear strength of this article, and conclude that EBD delays inevitable surgery. They state that EBD might be viewed as a bridge surgery for most patients. Careful selection of patients is key to avoid unnecessary complications at repeated endoscopic procedures. This article has an accompanying continuing medical education activity, also eligible for MOC credit.